Most of my out-of-the-house work is loaded into the afternoons and evenings. Monday night, J-P and I were at the Bike Kitchen from 6:30 til 9:30, so we ended up having a pizza delivered there. We were there late Tuesday night, too, but we didn’t want two dinners out in a row. So, at 9:20 Tuesday morning, I found myself simultaneously mincing garlic and monitoring the progress of two hard-cooked eggs and a third seasoning of the cast iron skillet. The garlic and eggs were (ostensibly) for that night’s late dinner, the skillet just because. For the dinner, I followed Elaine Louie’s recipe for Bihari Green Beans Masala. 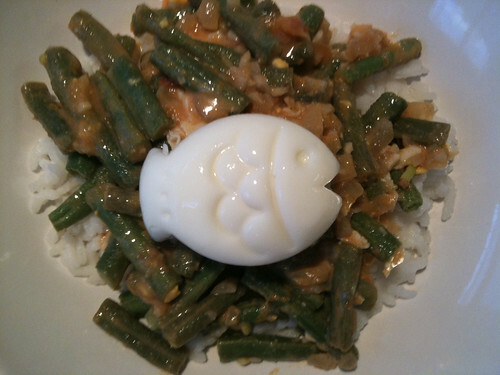 To up the protein, I decided to cook it Burmese style–or at least Burma Superstar style–by adding hard-cooked eggs. I decided to form the eggs into cute shapes using Japanese egg molds. I have two: one succeeded, one failed. The failed egg got unmolded and unceremoniously chopped and stirred into the sauce. The other became garnish. I had a little of the dish for lunch yesterday, but I wasn’t thoroughly pleased with the taste. So I added some slivers of ginger before I put it in the fridge, hoping that they would add their flavor over the course of the day and while we reheated the food. The ginger actually ended up having more time than that to do its work, because we were weak creatures of habit last night and went to the St. Francis instead of going home to the food I’d made. (It’s all right, I was craving French fries.) By tonight, the ginger had worked some magic. I’d recommend the recipe, as long as you simmer ginger in the sauce in the first place. All of this brings me to one more change that living in California has made to our household cuisine: more Asian flavors. A red coconut curry sauce was already part of my repertoire before we moved here. (Thai restaurants were my chile-using refuge in a Boston barren of good Mexican.) Here, we’ve experimented with Mark Bittman’s Asian-fusion sauces, which have generally disappointed us with their strong taste of Worcestershire. His fried garlic and ginger sprinkles are genius, though, and my dal makhani turned out all right. But the real winner so far has been our Bike Kitchen friend Al’s 1-2-3 pork: pork simmered in 1 part rice wine, 2 parts vinegar, 3 parts (or less) sugar, 4 parts soy sauce, and 16 parts water. I’ve also added a crushed garlic clove and a crushed half-inch of ginger to Al’s 1-2-3 sauce, but it’s perfectly tasty as is. I think the main reason Asian and Asian-inspired recipes are so hit or miss for us is that neither of us has enough background with any particular Asian cuisine to judge a recipe before we’ve tried it. We just haven’t built up a sense of which ingredients produce which flavors, or how they work in combination. Give us chiles, onions, tomatoes, and we’re golden. But we’ve only just added sesame oil and mirin to our pantry.